If you like to order out at all, you have restaurant take out menus at home for your favorite restaurants. You might even have a few coupons for your favorite places too. Tossing everything into a single drawer is a fair start to organizing your menus. At least they’re not spread around the house. But if you really want to organize those menus so you can find what you want quickly, then give these a try. Sort your menus to see what you have. Make labels for each food category type. 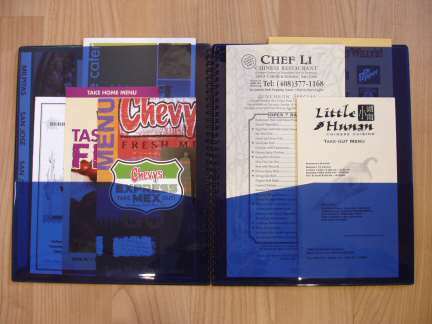 Put the take out menus in the plastic cover sheets and put them in the appropriate divider sections. If you want to be able to put two menus in a single sheet protector to save more space, place a plain piece of paper in the sheet protector. 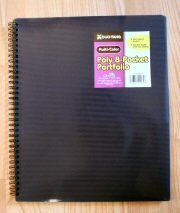 That way you can use the space on both sides of the paper, like two pockets in one sheet protector! OK, let’s face it. Not everyone has that many menus or is that over the top organized. Be sure to place any restaurant coupons you receive in the binder or folder along with the corresponding menu. That way you’re sure to see them when you’re looking to order from that restaurant and save some extra money! Be sure to go through your menus and coupons periodically. Coupons can collect and expire, so be sure to toss the old ones. Menus can change so be sure to take a peek at the menu when you’re picking up your food to see if it has changed. Grab one to take home with you. Keep a pen and a pad of paper handy for taking down orders and you’re all set to go!